Erith blogs at Cracking Retirement about having fun in Retirement, making the most of her money, travelling far and wide and enjoying her hobby: bashing metal. There was a lot of publicity for food banks this Christmas, particularly around the theme No child should go hungry at Christmas, however, no child should go hungry on any day of the year in a country such as ours with plentiful resources, and where a lot of food is wasted every day. So, we need to maintain the support for foodbanks every month of the year. Foodbanks don’t only need goods, they need people who can help distribute the food and they need money to keep their warehouses going and run vans to be able to pick up food donations. They can also use money to make bulk purchases of food at wholesale prices. I started thinking about this post during the UK Money Bloggers campaign for a ‘Reverse Advent Calendar’, where each day through November everyone would put a donation into a box and at the end of the month delivered the box to their local foodbank, in time for the Christmas distribution. This was massively successful. However, when January comes, the weather is usually freezing. People who are struggling to feed themselves rarely have money for heating. 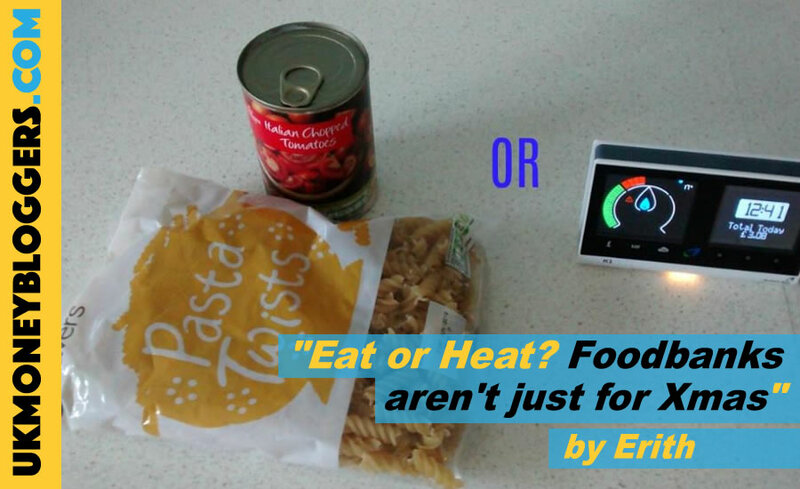 Many are on a ‘pay meter’, so their choices are food or heat, and often neither. I have been cold often (think old houses, poor heating, lots of draughts), but I have never yet had to go to bed with no food because I could not afford it. I heard the other day on the radio, that someone who had supported a foodbank with a £500 donation in 2016, was dependent on a foodbank donation himself in 2017. He had lost his job, used his savings and he and his children were hungry. Circumstances can change so very quickly, he wasn’t a waster, he had no drug or alcohol problems, life had just hit him hard and he was unable to respond. So as we enter 2018, it is time to think long and hard about how we can support those people who have dropped below ‘making ends meet’. How can we do that? If you do not have a lot of money, have you some spare time so you could help out at a foodbank? It wouldn’t cost you anything, and you might even meet some new friends. If you don’t have spare time or much spare money, could you fundraise for your local foodbank? Some firms will support their employee’s charities. When I was working, my company gifted to any charity that their employees supported through Payroll Giving. In addition, they would give a donation if a group of employees got together and did some charity fund-raising. Foodbanks can benefit from support and publicity to widen awareness of the campaign to support them. What am I going to do myself? I’ve set up a regular donation each month to my local Trussell Trust foodbank, here is the link to help you find yours. I am overweight… it feels appropriate if I started a sponsored weight loss campaign on 1st January. Every pound I lose by eating less, would raise pounds for those who are struggling to afford to eat at all. It will certainly help me keep focussed! Have you any bright ideas that would inspire you and those around you to help? If you work in an office, maybe you could do a ‘bring a cake’ day, where everyone brings a cake, and gives a contribution to try some of the other cakes. You might be doing a ‘Dry January’ or a ‘Veganuary’, so the foodbank would be a worthy cause to support if people will sponsor you. Some organisations such as the WI have boxes where you contribute items when you attend a meeting. I am sure many others such as Mother & Toddler groups could also do this. If you get unwanted toiletries sets, then please pass them on too, also toothpastes, toothbrushes, deodorants. Do you have links with the media? Can you get some publicity for this very good cause? Please leave some comments below with other ideas which might inspire others to follow your lead. Let’s try and make sure no child is hungry in the UK in 2018. Thanks to the following UK Money bloggers who supported the #FoodBankAdvent campaign and helped me with great suggestions for this article: Helen from Complaining Cow, Sara from Debt Camel, Faith from Much More With Less, Katy from KatyKicker, Eileen from Your Money Sorted, Hollie from Thrifty Mum, Cat from Penny Wise Life Rich, and Thrifty Lesley.